"The music world can be a very disgusting place." Like a lot of bands, the extremely low-fi trio Low hails from the United States (Minnesota, precisely) and has found larger success overseas than they have in their home country. 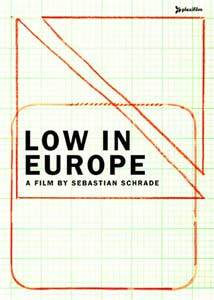 For Low in Europe, director Sebastian Schrade trailed behind the philosophically talkative Zak Sally, Mimi Parker, and Alan Sparhawk as they made their way through England and Germany on a tour to support their most accessible release Truth, but if you come to this doc expecting raucous debauchery and high-living rock antics, you'd better go elsewhere. The band's music is amazingly sparse, almost derivative and one-note if you happen to be in an overly argumentative frame of mind, but for ten years or so Low has continued on their even plane of musical minimalism, sparking some critical nods along the way. Making that leap over the wall of record sales success doesn't seem to be a major concern, and to hear drummer/vocalist Mimi Parker talk it's almost a non-issue. Schrade, filming in stylish black-and-white, lets the band expound for 50 minutes on life on the road, staying true to themselves amidst the hassles of unprepared journalists, settling on a set list or the irony of meeting death metal band Napalm Death. Some of the comments from Sally, Parker, and Sparhawk might come across as marginally overwrought, and their seemingly deep disdain for the music world (especially Sally) could make some non-fans wonder why they keep going on if things are so miserable. But a moment comes when Schrade captures a live rendition of The Last Snowstorm of the Year—an almost perky Low number by comparison—and it carries quite a gentle emotional punch, showcasing the band as alt-folkie modernists who know how to carefully blend their voices, full as they seem to be of sorrow, over a spartan guitar bed. Compare this to some rock docs, and Low in Europe will hardly rank when it comes to muckraking, craziness or yet another seen-it-all VH1 Behind The Music confession. It may not make for exciting viewing necessarily, but Sally, Parker and Sparhawk are intelligent and serious musicians, firm in their resolve to be who they are and hope that audiences will quietly step in line. Sebastian Schrade gets the band to open up rather easily, interjecting an assortment of live performances between the introspection. Their music may be difficult to fully immerse yourself in immediately, but knowing how sobering the creative process is and how steadfast the musicians are, it can do nothing but ratchet up the desolate intensity. Image Transfer Review: Schrade's film is presented in 1.33:1, a combination of black-and-white and color. The color sequences, used for a handful of concert clips, tend to run a bit dark, but the black-and-white segments look arty (with some intentionally grainy sequences), with a reasonable amount of image detail. Audio Transfer Review: Audio is provided in PCM stereo, and for a low-fi outfit like Low the lack of a more expansive mix doesn't hurt the presentation at all. The interview segments are clear, and the live performances actually sound stripped and extremely plaintive. Extras Review: Extras aren't extraordinarily plentiful, and consist of deleted Super-8 footage (14m:33s) from 2002—recorded in Frankfurt, Germany—contains alternate versions of Take the Long Way Around the Sea and The Last Snowstorm of the Year, and some additional interview footage. The disc is cut into 13 chapters, with optional German subtitles. It's funny, but the band members of Low really encapsulate the mantra-like spell of their methodically, minimalistic slow music in their personal life, and for a band that remains way under the radar this short doc smartly captures them doing it their way on a handful of European dates. Low exists way down on the far end of the rock spectrum, churning out sweetly hypnotic and forlorn music for whomever might take the time to listen and get it, and you have to admire their artistic determination to remain largely unchanged by things like commercialism. It's just a shame that a full live set wasn't also included here. Still, for the adventurous music type, this is recommended.